What a goal! A great one-two pass before the header. 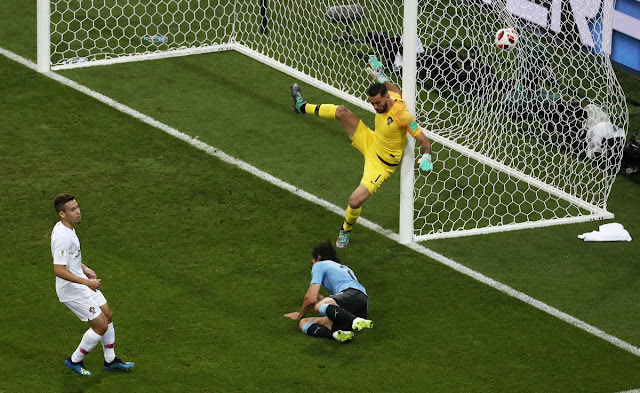 Edinson Cavani played switched the play from the right to the left with a long range pass to find Saurez who held on to the ball, cut inside to his right foot to cross for Cavani to run into the box to head home Uruguay's first goal of the match against Portugal. Fantastic combination by both Uruguay star players, born within 3 weeks of each other in Salto (Population 100,000) Just 2 kids from the same hood performing together on the world's biggest stage.